Nandita, a doctor, nutritionist and food blogger, is extremely popular for her tasty recipes. It’s 2018 and it is no longer creepy if you admit that you have been following someone for longer than you know them. Or is it? Err…I don’t know. I’ve made several acquaintances and friends from people I’ve followed on social media and one of them is Dr. Nandita Iyer, who runs the extremely popular food blogging website – www.saffrontrail.com. I started following Nandita, who lives in Bengaluru, on Twitter sometime in 2012 and I have checked out her videos on YouTube as well, but it’s her Instagram stories and posts that I enjoy the most. There’s some amazing food photography happening there along with her easy to understand step by step demonstration of recipes. Her website is a treasure trove of ideas not just for vegetarians but those who want to try out interesting and tasty desserts and I had bookmarked her post on using the air fryer as well, something I keep going back to every Ramzan! Birthday boy breakfast waffles for the friends who stayed over. - a bunch of toppings can make less than perfect waffles look smashing! . Basic chocolate waffles topped with sliced bananas, whipped cream and chocolate sauce. . Used Amul whipping cream for the first time. It was pretty hassle free. I did refrigerate the cream, bowl and whisk blades overnight in the fridge though. . What are you familiar toppings over waffles? 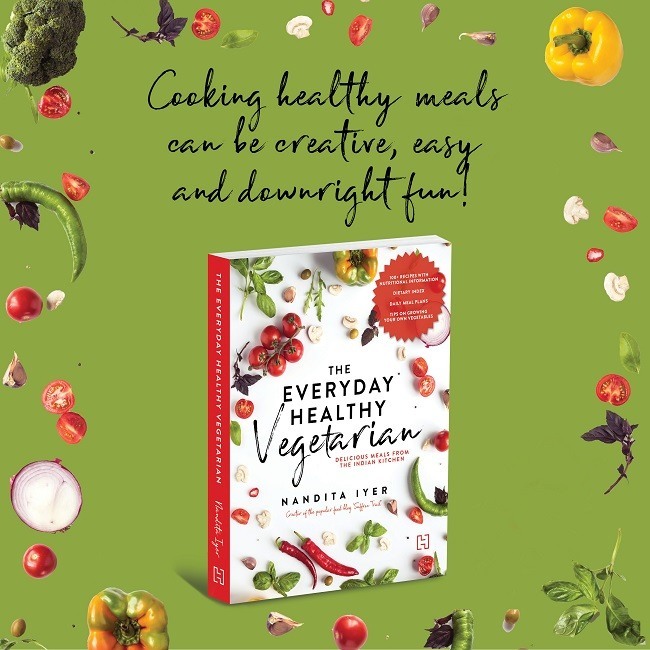 Nandita’s book The Everyday Healthy Vegetarian is being published by Hachette and is available for pre-order. The book hit the best seller list on Amazon within just hours of being announced and should be available in early January. She also won The Lifestyle Influencer Award by Better Homes and Gardens India and Social Samosa for Best Original Recipe Blogger on the last day of 2017. Nandita wears a number of hats – doctor, nutritionist, blogger and now author. I had the opportunity to ask her a few questions about her journey from being a food blogger to a cookbook author. Loving food and loving to cook are two different things. Which came first for you and when did you decide to take your passion for cooking into a full-time career? It was the natural scheme of things. I didn’t quite plan anything. Blogging and social media became a big phenomenon around 2012 and it was good to be there. More like right place-right time, I suppose. Saffrontrail is ten years old now. How much has the site changed since you started? I started my blog in 2006 so it will be 12 years old this March. Earlier the blog was a bit more stream of consciousness, no knowledge of SEO, no calendar planning, no keyword analysis. Today, it is all very strategic. I have already planned my calendar for the first three months of 2018. Food photos were more of a blur when I started. Over the last couple of years, I put a little more effort into styling. Better cameras help too. How did you start using social media to promote Saffrontrail and how much have things changed with regard to social media from the early days? I’ve been on social networks even before ‘social media’ was a term, starting with ryze.com in 2002-2003. So it came naturally to me to share my blog content on social media, although my focus was more on Twitter. But I realise, Pinterest is where the foodblog traffic comes from and I need to put maximum efforts into that platform. Twitter works better for visibility, brand building and networking. What was the journey like from blogging to becoming an author? I started my blog in 2004 and in 2005 I already had a book deal. But life threw some googlys at me and I was unable to take up the offer. Blogging needs commitment and discipline to become a successful blogger and becoming an author needs the same but in larger measure. Both need single minded focus on producing quality content for the readers. Do tell us a bit about your book and what to expect from it. The Everyday Healthy Vegetarian is a good handbook for anyone who wants to eat healthy. It has simple and quick recipes for the busy lifestyles we all lead today, using mostly everyday ingredients. I have divided into four sections - Good Carbs, Eat the Rainbow, Protein Punch and Healthy Fats, so the recipes are all divided between these sections. It has useful indexes such as Vegan, Gluten Free, Diabetic Friendly and Superfood recipes, which the reader can follow as per his/her preference. There’s also a whole lot of information in the introduction pages including how to set up your kitchen, stocking up on ingredients for healthy cooking, menu planning, time saving tips and more. Do you plan to restart your Breaking Bread (loved the name!) workshops again? The workshops had to stop because I needed to focus a 100% on the book. I would like to restart teaching healthy cooking. It is always fun to connect to the readers offline, and the one-on-one interaction always feels good. Writing a cookbook is vastly different from writing a novel. How long did it take for you to do everything for the cookbook, from testing to photography etc? Writing a cookbook is a lot of work. Planning out the kind of recipes to include, ordering ingredients, cooking, cleaning, looking at the nutrition profile of the recipes, and then of course the writing itself. I found myself wishing many times that I were writing fiction. At least I wouldn't be staring at endless shopping lists and overflowing kitchen counters. Of course, I do know that writing fiction is not easy either! The entire process took 18 months I think. With so many food bloggers around, how can a new food blogger stand out from the crowd? Mastering any one platform and then getting the audience to their blogs seems to be the best way. Taking eyeball grabbing photographs is the best way to shine on platforms like Instagram which then helps one stand out in a crowd, but the competition is way too much. So, the slow and steady way is to keep consistently putting out great content on the blog and staying connected with the readers. Lastly, will you be cooking something at your book launch for the audience? I’m sure there will be food from the book at the launch!